Two-headed snake has always been in the stories. This week, the nightmare-inducing creature showed up in a yard in Woodbridge, Virginia. A photo was sent and posted to the Facebook page of a wildlife expert, and it quickly became a social media sensation. It was a unique find in the herpetology world because two-headed snakes rarely occur in the wild. Those that are alive have often been bred in captivity. State herpetologist J.D. Kleopfer said on Facebook that finding a two-headed snake in the wild is an “exceptionally rare” find. “This is an extraordinary animal,” said Kleopfer. He’s been studying snakes for more than three decades and, like many local snake experts, said he had not seen anything like it in his career. “This is a Ringling Brothers and Barnum & Bailey Circus kind of moment,” he said. After looking at the snake, experts estimated it was about 6- to 8-inches long and was about two or three weeks old. “The fact that it was also young made it an extraordinarily rare find,” Kleopfer said on Monday. A few more days in the wild, he said, and it probably would have been eaten. Experts said two-headed snakes are like human conjoined twins. The mutation happens when an embryo starts to divide into identical twins but stops. It is possible to separate two-headed snakes, and they can learn to be independent, experts said. The tale of the two-headed snake discovery started about a week ago. A woman was coming out of her house in Woodbridge when she spotted the snake in her flower bed. Rich Perry, who runs a wildlife removal company – Virginia Wildlife Management and Control in Powhatan – said he was one of those who helped identify the snake. “She was afraid it would get away and having kids and pets, they were going to get bit,” Perry said. She scooped it up in a plastic bin, according to Perry, took a picture and posted it to her neighborhood email group, asking if anyone could identify it. Someone on that group saw the picture and sent it to Perry, who runs a 24-hour hotline that helps identify snakes. When he saw it, Perry said, he knew it was a venomous copperhead. “It was absolutely incredible,” Perry said. He said he has dealt with “hundreds of snakes every year” during his 40 years in the wildlife removal business but has never seen anything like this. “It was a fluke thing. Just a freak of nature,” Perry said. The homeowner did not wish to be identified, according to Perry. He said Monday that at least six people, including the owner of a private museum, had reached out to him, offering to pay for the snake because it is so rare. Kleopfer, the state herpetologist, was called in on the case of the two-headed copperhead two days after it was found. It was a huge milestone in his career; he said he’d only read of two-headed snakes and not seen one alive, much less so young. 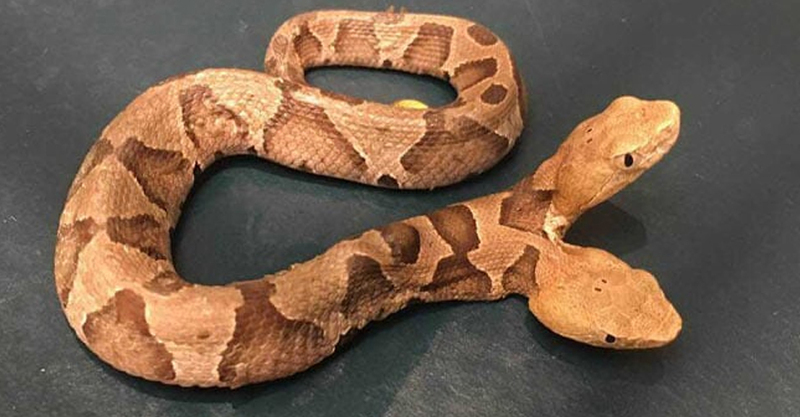 It isn’t the first time a two-headed copperhead has been found in Virginia. In the 1990s, one was found in Charlottesville, Virginia, but it was killed and brought to state herpetologists, according to Kleopfer. “Finding it alive, that’s more extraordinary than if someone brought it to me in a baggie chopped up into two or three pieces,” Kleopfer said. After they picked up the snake from Woodbridge, they took it to a wildlife expert in Virginia who specializes in breeding and raising vipers. Herpetologists got a chance to make some observations on the rare find. After doing radiographs, experts found that the two-headed snake has several other unique features. The snake has two heads but one heart and one set of lungs. Both heads appeared to have venom, according to Kleopfer. “Based on the anatomy, it would be better for the right head to eat, but it may be a challenge since the left head appears more dominant,” experts at the Wildlife Center of Virginia said in a news release. Kleopfer said officials hope the rare snake will eventually be donated to a zoo. But his first concern is getting it eating well and growing, which could take two or three months. One sign that it’s growing healthy, he said, will be seeing it shed its skin a couple of times. In looking at the X-rays, Kleopfer said herpetologists were fascinated that it had two spines that fused together to have two heads. Surviving as a two-headed snake in the wild is tough. One problem for two-headed snakes: they fight. Experts said two-headed snakes will often fight over which head swallows prey. Eating can take time and that frequently leaves the snake vulnerable to predators. Not to mention the trouble of deciding which way to go. They often can’t respond quickly when they are attacked. “One head wants to go this way, and the other one wants to go that way,” Kleopfer said. And as far as names, Kleopfer said he hadn’t named the two-headed snake. He doesn’t want to jinx its survival.